So what will we glean from these Laws of Thought? First, they are natural laws which man cannot control; regardless of their desire. The truth was as critically important then and it is today in finding solutions to problems. These three laws are the foundation of every country’s legal system. Mankind continues to be a selfish creature; wanting what it wants above the truth. 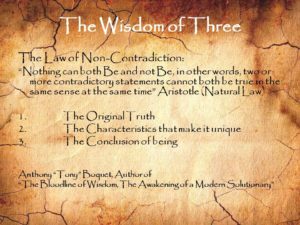 The Wisdom of Three gives us the blueprints for solving all of our problems. These are just a few lessons we can learn from these laws. In 970 BC, 500 years before these laws were written, the first Solutionary, King Solomon was already a master at them. The principles taught by Solomon are not unique to the Jews; they apply to all people in all times. We should find a way to return to teaching these laws to our children. Though the laws are eternal, their lessons and their application have obviously been lost to the passage of time. Enjoy and please share this information with everyone you know. 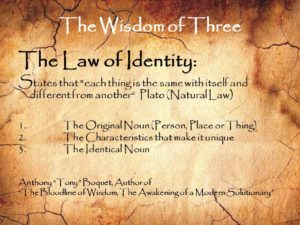 Dating back to ancient Greece, circa 369 BC compliments of the philosopher Plato, a student of Socrates and a teacher of Aristotle, the law of identity is the first of the three classical laws of thought. It states that “each thing is the same with itself and different from another”. Realizing that in order to communicate with clarity, people needed to distinguish one thing from another. Regardless what we talk or think about, things all have their own unique set of characteristic qualities and features, which the ancient Greeks called its “essence”. The philosophers of their time came to the sensible conclusion that things that have the same essence are indeed the same thing, while things that have different essences are different things. For instance, a bird is not a cat. I know what you are thinking, duh. Well, don’t be so fast to believe that everyone understands these laws of nature. Here we are about 2500 years later and our so called leaders are trying to convince us that one thing is another. It happens every day. Even in the BC era, people wanted to have it both ways, especially when it fit their personal agenda. They too wanted others to agree with their position when they argued for an issue that was false but instead, these inaugural thought-leaders stood up and spoke out against foolish thinking by clarifying the truth. The Greeks clarified that in every case, every circumstance, and every condition there can only be what is true and what is false. 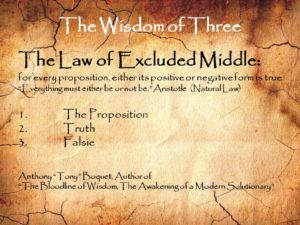 There is no middle ground when settling contradictions. The answer will always be true or false; it cannot be true and false at the same time. The result of this simple law befuddles the minds of those wishing things to be as they imagine them to be.